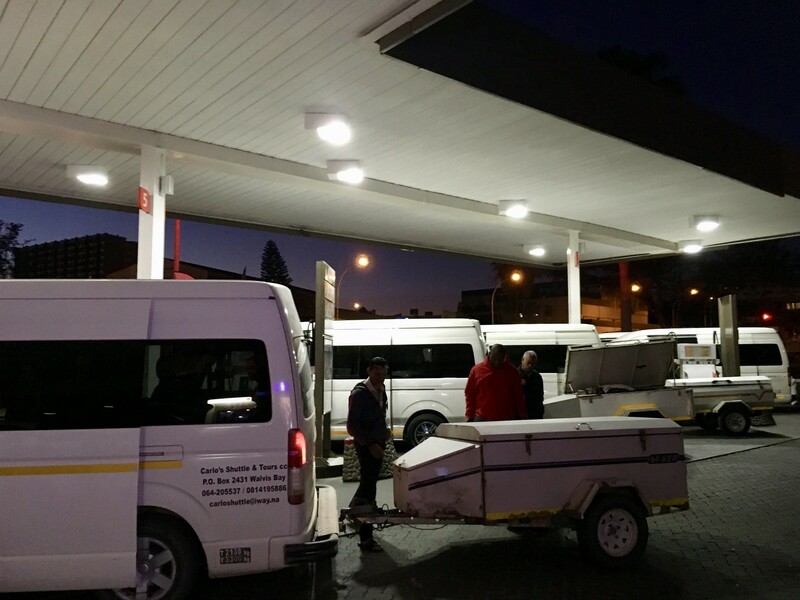 Carlo’s Shuttle in Namibia runs a minivan shuttle between Windhoek – Swakopmund – Walvis Bay (in addition to private shuttles or car rental) for 250 NAD each way. They do door-to-door pick up and drop off. I found them while searching online for shuttles from Windhoek to Walvis Bay. I believe you can take a unscheduled minibus for cheaper (wikitravel reports ~100 NAD), but I like reliable, and reliable Carlo’s Shuttle is. This is rather important in Namibia, considering the other shuttle service I booked no-showed. I found them about 2 days before I was scheduled for the trip, and used their online booking form to book my shuttle. I got an e-mail reply in under 24 hrs asking for a confirmation – a good sign. I was informed that I would be picked up at my hotel between 6 am – 7 am, and at 6.30 am, the driver showed up with cellphone in hand, indicating that he would have called if I wasn’t there. Everyone booked on the shuttle has a seat each, so there won’t be squeezing, giving a stranger an extended lap dance, etc. The driver was also very safety conscious. On the way back, one of the tyres was a little low on pressure, and instead of just brushing it off and moving along, the driver stopped along a gas station to get it checked out. This is highly preferable to the vehicle breaking down in the middle of nowhere. If you’re traveling in Namibia and they happen to serve your routes, use them with confidence. You can access their site here, and they can also be contacted via Whatsapp (+264 81 270 4395).